Commercial Crew astronauts slide down wires during a Boeing/United Launch Alliance (ULA) emergency-egress system demonstration at Cape Canaveral Air Force Station's Launch Complex 41 in Florida on June 19, 2018. Astronauts in danger on Boeing's new space capsule will be able to jump into bright orange seats and whoosh down zip lines to get away from their spacecraft before liftoff. And this summer, the space flyers got the chance to test out the superfast emergency-evacuation system. 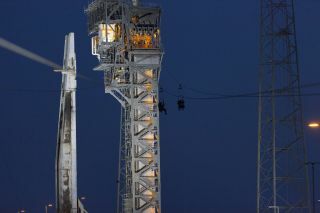 In the event of an emergency prior to liftoff on launch day, an emergency egress system would carry astronauts and ground crew more than 1,300 feet away from the crew access tower. A demonstration of the procedure was held at Cape Canaveral Air Force Station's Launch Complex 41 in Florida on June 19, 2018. Photographers Kim Shiflett and Frank Michaux captured the scope of the test in captivating imagery for NASA's Kennedy Space Center. In an emergency, each person on board the commercial spacecraft would have to slide more than 1,300 feet (396 meters) to arrive at the safe area, according to photo descriptions provided by the space agency. Astronauts participate in a Boeing/United Launch Alliance (ULA) emergency-egress system demonstration at Cape Canaveral in Florida on June 19, 2018. The Boeing CST-100 Starliner will launch on a ULA Atlas V rocket, carrying astronauts to the International Space Station. United Launch Alliance partnered with the zip line company Terra-Nova to build the evacuation system. It's similar to the slide-wire baskets that the agency used for space shuttle crews, and it features large seats to accommodate pressurized flight suits. The seats are also colored bright orange to make them easier to see. The goal is to get astronauts and launchpad crew off the crew access tower and down to the ground in 90 seconds. As many as 20 people can evacuate through the egress system. Commercial Crew astronauts test out the Boeing/United Launch Alliance (ULA) emergency-egress system on June 19, 2018, at Cape Canaveral Air Force Station's Launch Complex 41 in Florida. The escape system will be in place when Boeing's CST-100 Starliner, placed atop a ULA Atlas V rocket, carrying astronauts to the International Space Station. "We are confident we identified the root cause, and [we] are implementing corrective actions now," said John Mulholland, vice president and program manager of Boeing's Commercial Crew Program, on Aug. 1, according to SpaceNews. The publication said that Mulholland did not specify what that root cause was but said that corrective actions will include slight design and operational changes. NASA's mine-resistant ambush-protected vehicles, or MRAPs, will be used in the unlikely event of an emergency at the launchpad prior to liftoff. The vehicles were originally designed for military applications and offer protection for astronauts and ground crews if they need to get away from the launchpad in an emergency. The MRAPs are seen here during a Boeing/United Launch Alliance emergency-egress system demonstration at Cape Canaveral in Florida on June 19, 2018.